Portrush Townhouse is the perfect town centre location, just 200m from the sea and within a 5 minute walk of two golden sand beaches; it is close to all public transport stations, amenities, entertainments and amazing eateries. Within 10 miles are many of the Provinces main tourist attractions, including the Giants Causeway, Carrick-a-Rede Rope Bridge, Dunluce Castle, Old Bushmills Distillery and ‘Game of Thrones’ filming locations at Ballintoy Harbour, Portstewart Strand and ‘The Dark Hedges’. 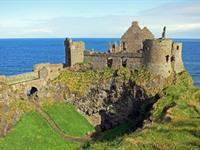 - is the much photographed medieval castle dramatically situated on the edge of a basalt cliff overlooking the wild Atlantic Ocean. Many local stories and folklore surround this stunning ruin. 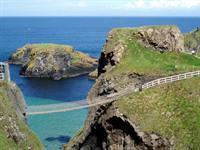 - is the famous salmon fisherman’s bridge first built in 1755 to connect the mainland with Carrick-a-Rede island. A thriving fishing industry for centuries, 2002 saw a sad decline in the industry and the last fish was caught at Carrick-a-Rede, now a thriving tourist attraction and great way to experience the Atlantic Ocean from a Birdseye view. - is a world heritage site and geological wonder of tall basalt columns. Dramatic cliffs and the wild Atlantic Ocean provide a breathtaking setting, which have inspired creatives for centuries. 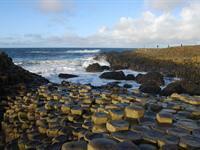 The visitor centre is open 9am - 5pm, the Coastline path and North Antrim Coast path are open dawn until dusk. Warm welcome, everything explained very well and we were shown to our room. Was great knowing someone was available if we needed any help. Room was very clean and tidy and very close to bathroom which was also very clean. Location is brilliant for local restaurants and bars etc excellent value for money for what you get. Overall a hidden gem that the whole party agreed would be happy to return to in the future when staying in Portrush.